Does anyone know corresponding fuel percentage adder for the TSII for the L-Jetronic? Even rough estimates would be ok.. I've read somewhere its 30% at the coldest point, but can't find any additional data to back that up. If I don't find this, I may have to bench drive the ECU. I figure someone must have figured this out already. luftvagon wrote: Does anyone know corresponding fuel percentage adder for the TSII for the L-Jetronic? Even rough estimates would be ok.. I've read somewhere its 30% at the coldest point, but can't find any additional data to back that up. What is the measurement variable "30%" of what/when/why/where/who? Why not reverse engineer analyze? With a warm engine (310 is a typical Dakota Digital idling head temp) at a known fuel ratio (let's say 14.3 at 950 rpm) and a known 60 ohms at the TS II, let's say, you go get the other TS II out of the freezer and plug it in and ground it, quick. What is the fuel ratio now? You will love this... 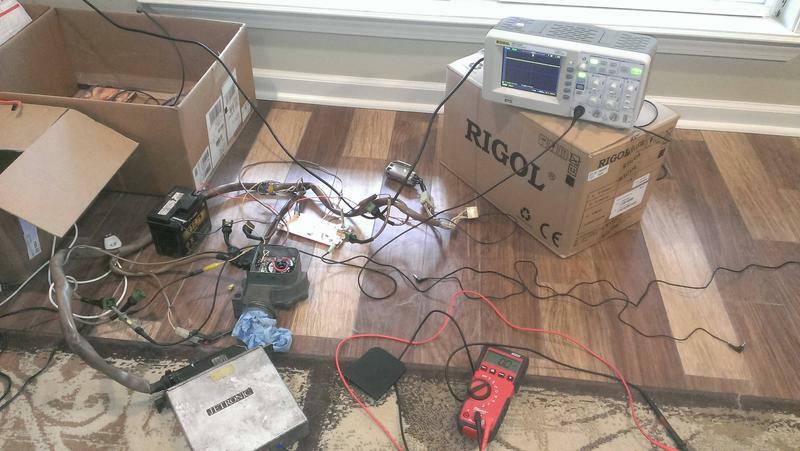 I made a test jig to fake the RPM signal, and potentiometer to fake the TSII... this will get interesting.. I'll start a new thread -- excuse the mess..